Most safety managers don't have the luxury of a healthy safety reporting culture in their aviation safety management system (SMS). Managers daily struggle to boost their monthly safety reporting metrics' up to 10% of employees, or one report per month for every ten employees. In 1976, NASA and the FAA recognized that a neutrally-operated confidential aviation hazard reporting system was required to engender trust among the aviation community. Furthermore, the reason that NASA operates the largest confidential aviation hazard reporting system in the world is due to the fact that these regulators knew that the aviation community was distrustful of any system controlled by the regulatory agencies. In those earlier days, safety culture was not considered with the importance that it holds today. In most aviation cultures today, the "Just Culture" is commonly preached and occasionally practiced. 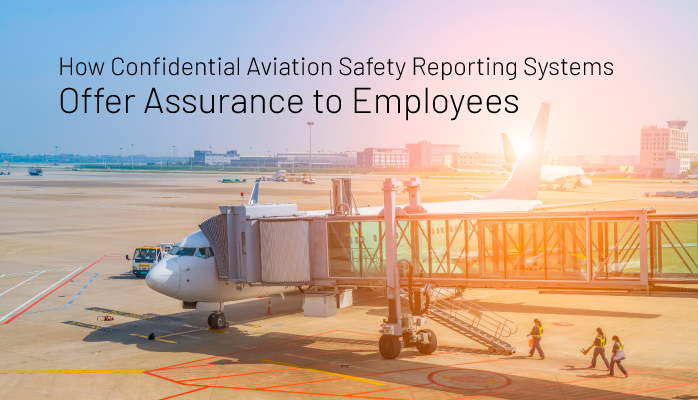 In this article, we shall discuss how safety managers can improve their safety reporting culture with the assistance of a secure, confidential, aviation safety reporting system backed by a non-punitive reporting policy. What Is a Confidential Safety Reporting System? Furthermore, ethical aviation service providers that profess to have an anonymous hazard reporting system do not dig deeper to investigate who reported the issue. Believe me, I know because I've worked with hundreds. Confidential reporting is where the reporter is not hiding behind a veil or anonymity; however, only the safety team and the reporter know who reported the issue. Modern aviation SMS databases treat confidential safety issues as sensitive issues. Confidentially reported safety concerns are restricted from all other managers, and in most cases, even the upper-level executives. Confidential reports are typically filed when an employee wishes to report safety hazards without the knowledge of his immediate supervisor. After all, the ultimate objective of any safety reporting system is to save lives and protect resources. For several identified reasons, some department heads discourage reporting all potential safety concerns. They prefer to handle the "small stuff" in an informal manner. Consequently, there is no documentation available to the safety team to identify trends from historical SMS data. This becomes a real problem that will eventually cost the operator in the long run. Furthermore, the safety culture will never fully mature and decision-making efforts in the predictive risk management phase will be skewed from an incomplete picture of hazard, risks and the effectiveness of risk controls. If your aviation SMS inadvertently leaks an anonymous or confidentially reported safety issue, your safety department may spend years rebuilding lost trust. Safety reporting cultures take considerable time to build up to healthy reporting metrics based on demonstrated trust from management. However, safety culture can very quickly erode and stagnate without proper care and sensitivity to reporters' request for confidentially managing their reported safety concern. The purpose of a confidential reporting system is to promote safety for everyone. I don't believe that it is enough for safety managers to simply tell employees that the safety reporting system has anonymous and confidential reporting. This information is typically provided to employees in their initial SMS training. Some operators may remind employees of the confidential reporting system during recurrent SMS training, but the sad truth is that recurrent SMS training isn't a guaranteed activity. Does your company provide recurrent SMS training? Have you ever had to demonstrate tracking of recurrent SMS training? I hope so, but unfortunately, I see little documentation from approximately 50% of aviation SMS implementations that I review. Recurrent SMS training does not have to be formal classroom training. You can use computer based training in your SMS database to administer, track and document recurrent training activities. Messages from accountable executives on the electronic message board. There are many ways for proactive safety managers to continue to preach this song: "anonymous and confidential reporting!" There will be a few disbelievers, especially in suspicious, toxic safety cultures. After time passes and no repercussions come from the SMS reporting system, employees will begin to trust the system and be more inclined to report hazards to the safety department. In the long run, this incessant preaching will benefit your safety culture. Product advertisers will often claim that the message must be seen between three to seven times before the message is absorbed. This is called "effective frequency." Aviation safety reporting systems remain a critical component to every aviation SMS. 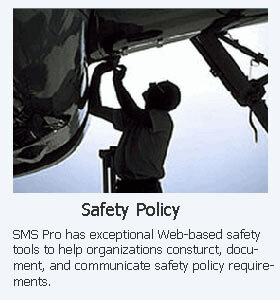 Safety reporting, along with auditing processes, fuel the safety assurance processes in an SMS. As safety concerns are submitted, they are process according to documented risk management processes outlined in the SMS manual. Anonymous reporting is great when employees truly wish to remain unknown. However, this isn't always beneficial to the safety team. There are often cases when more information must be gathered during the risk management investigation phase. Anonymous reporting become a burden to the safety team when more information is required. With this knowledge, it is important that safety managers communicate the difference between anonymous reporting and confidential reporting. Make sure that anonymous and confidential reporting is highlighted in your aviation SMS safety policy. When these topics are promoted by top management, employees may be skeptical at first; therefore, encourage top management to reinforce anonymous and confidential reporting in your safety newsletters. Proactive safety managers will prepare "canned articles" for operational department heads to publish in safety newsletters under the department head's name. This keeps the department "on message" and allows the safety team control over safety content. Finally, encourage all employees to submit confidential safety reports whenever possible. This allows the safety team to follow up and manage organizational risk more effectively. If you remember, confidential does not mean "anonymous;" therefore, the safety team can contact the reporter for more information during the investigative process. How does a confidential reporting system save lives? Most employees won't report freely and honestly when their reports are transparent for the entire organization. And the report that was not reported may be the one that makes a difference between life and death. There was a study by Heinrich in the 1930 that has become popular today in risk management circles. Heinrich "suggested that the ratio between fatal accidents, accidents, injuries and minor incidents (often reported as 1-10-30-600, and sometimes called “Heinrich’s Law” or the “Heinrich ratio”) is relatively constant, over time and across companies." When safety cultures encourage active safety reporting of all potential safety concerns, especially the minor incidents that managers like to handle "informally," the SMS begins to capture valuable data that will serve as practice in the SMS' safety risk management (SRM) and safety assurance (SA) risk management processes. Practicing on these minor incidents strengthens effectiveness of risk controls because these practice "safety issues" allow for more constant monitoring of implemented risk controls. In conclusion, effective reporting of all safety concerns, no matter how minor, will increase the effectiveness of the SMS and hopefully delay "The Accident." Below are some demo videos of an aviation safety reporting system that supports both anonymous and confidential reporting. If you need some inspiration as to safety reporting processes, please review. Otherwise, if you find that your safety reporting system is hurting your safety culture, contact us. We'd like to be your SMS partner.